The ExoBeam sole technology combines stiffness in the forefoot, where most of a rider’s power is applied, with strategically engineered flex zones to reduce tension and strain in the lower leg (click to enlarge). The world’s largest bike maker is getting into the shoe business. Giant is introducing a new line of performance footwear, featuring what it calls Motion Efficiency System. 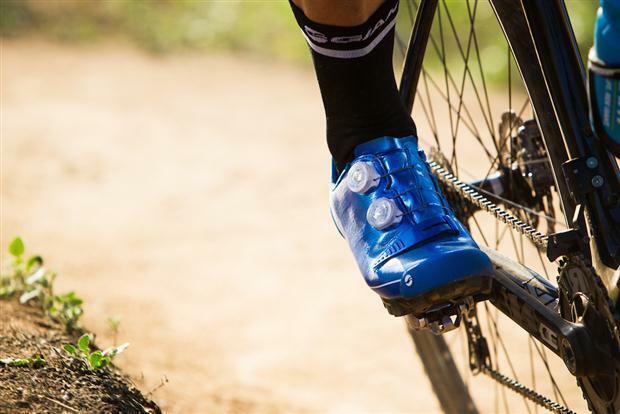 The new road and off-road shoes are claimed to deliver improved power transfer, comfort and fit. All of the new models were developed under Giant’s Dynamic Cycling Fit design philosophy, which aims to create gear that functions best while in motion. Three new models — the Surge road shoe, and the Charge and Amp off-road shoes — were conceived via a collaborative process that included biomechanics experts, the Rabobank Development Team, and Giant off-road racers. Testing was conducted at various laboratory settings, team camps and races around the world. Learn about Giant’s new wheels and saddles and get the scoop on their full array of helmets. The new Giant Charge is one of two new off-road models being offered (click to enlarge). The Motion Efficiency System combines a stiff and efficient pedaling platform with just enough torsional flex to reduce pressure and strain in the lower leg. The result, claims Giant, is a more natural foot movement throughout the pedal stroke, which improves both comfort and efficiency. The system is built around several key technologies: the ExoBeam sole structure, the ExoWrap foot closure, and the ExoFlex toe section for off-road models. The ExoBeam sole technology combines stiffness in the forefoot, where most of a rider’s power is applied, with strategically engineered flex zones to reduce tension and strain in the lower leg. 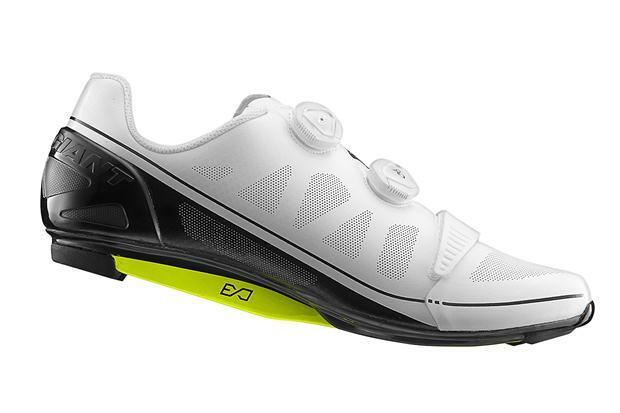 With the “beam” replacing the traditional plate sole structure used in most high-performance cycling shoes, a rider’s foot can be fully wrapped in the enclosure system. The ExoWrap works in harmony with the ExoBeam to form a 360-degree foot enclosure that creates customizable fit and comfort for all foot shapes. While most enclosures simply pull the foot down toward the sole, ExoWrap supports the foot by also pulling up. The new Giant MTB shoes are billed as having better traction when running or walking up steep climbs (click to enlarge). Off-road models including the Charge and Amp also feature ExoFlex, which allows the toe area of the shoe to move independently of the ExoBeam carbon sole. This results in better traction when running or walking up steep climbs. 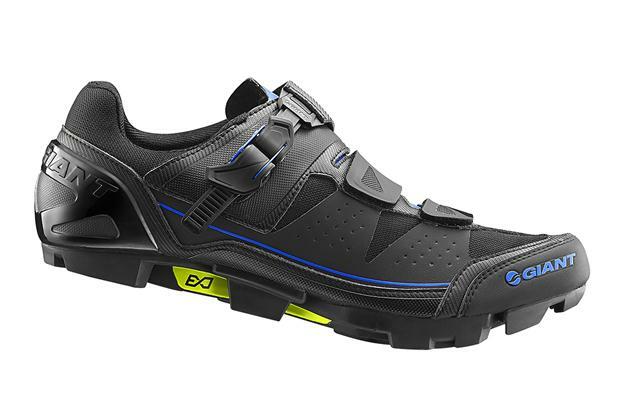 Ideal for cyclocross or trail riding, ExoFlex also reduces heel slip. The new footwear models will be available later this year. For more info visit www.giant-bicycles.com and learn more about the development of the new technologies in this video. 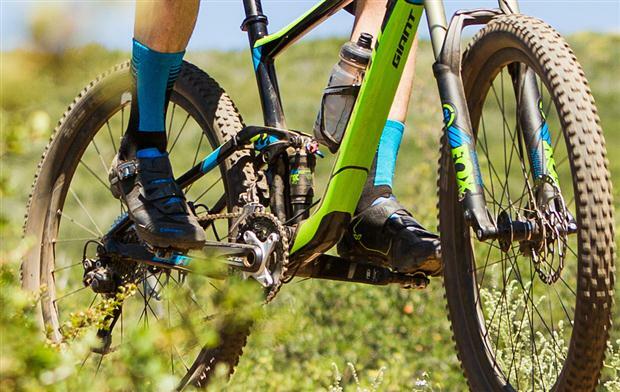 The new Giant MTB shoes are billed as having better traction when running or walking up steep climbs. 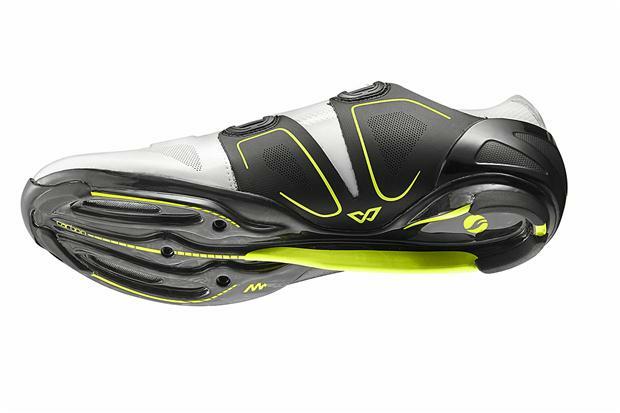 The new MTB shoes feature ExoFlex, which allows the toe area of the shoe to move independently of the ExoBeam carbon sole. The new Giant Charge is one of two new off-road models being offered. The ExoBeam sole technology combines stiffness in the forefoot, where most of a rider’s power is applied, with strategically engineered flex zones to reduce tension and strain in the lower leg. The ExoWrap works in harmony with the ExoBeam to form a 360-degree foot enclosure that creates customizable fit and comfort for all foot shapes. I’m glad they are doing this. We did not really have much in the way of choices for shoes. “Biomechanics” consultants are great, but how about shoemaking experts that can teach you a thing or two about fit? Did Giant look into different kinds of “lasts” and how they fit different kinds of feet? After all, these are SHOES.